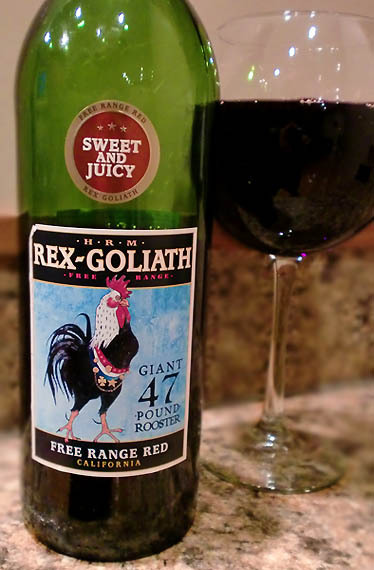 I've seen the Rex Goliath wines on the store shelves all over the place and I've always wondered what the heck was up with the rooster on the label? Well, according to the winery, Rex Goliath was a giant 47 pound rooster that was part of a Texas circus act, and the label is based on the circus banner that advertised this giant bird. So why do they use the rooster as the basis for their winery? Hell if I know. Their winery isn't even in Texas, it's in California. I don't get it. Oh well, not everything in the world has to make sense. Regardless, having a big rooster on your label does make it stand out from the horde of beige wine labels on the shelves, even if it's not in a classy way. Rex Goliath is a California-based winery that makes, well, cheap, budget wines. They're known primarily for their budget Cabernet Sauvignon, but now, I'm looking at their Free Range Red. This wine is reportedly a blend of Zinfandel and Syrah, although exact percentages are unknown. There is no vintage on this blend, so I'm betting the winemaker just tries to make it taste the same every year, which depending on the years' weather and yields, could be a tricky feat. Rex Goliath Free Range Red pours a deep, brick red. It smells primarily of strawberries, with a bit of raspberry. You take a sip and get exactly what you'd expect, more fruity, sweet strawberries and raspberries. Tannins and any oak are pretty much non-existent here. The finish is short and simple, as is, well, the entire experience of drinking this wine. Now I'm not saying it's bad, I've certainly had worse cheap red wines and there are no off-flavors, but it's just a bit boring. Okay, really boring. Really boring, simple, and straightforward. That being said, it is as the label describes it, "sweet and juicy." Drink This: if you like your red wines super cheap, sweet, and easy-drinking... which I know a lot of people do.